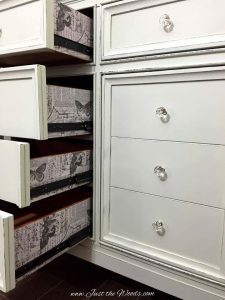 Disclosure: This decoupaged drawers post contains affiliate links for your convenience. 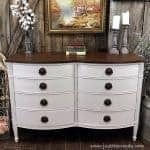 This dresser is the last piece of a custom bedroom set that I’ve just completed. 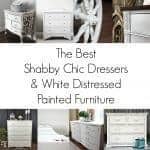 It’s a true transformation from modern and sleek to shabby chic. 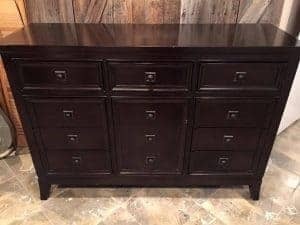 The dresser came in dark and modern with 10 drawers! 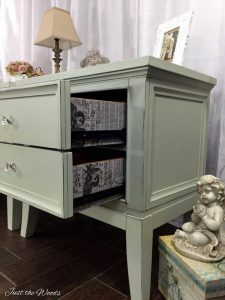 The wow factor was added to this piece with all decoupaged drawers. 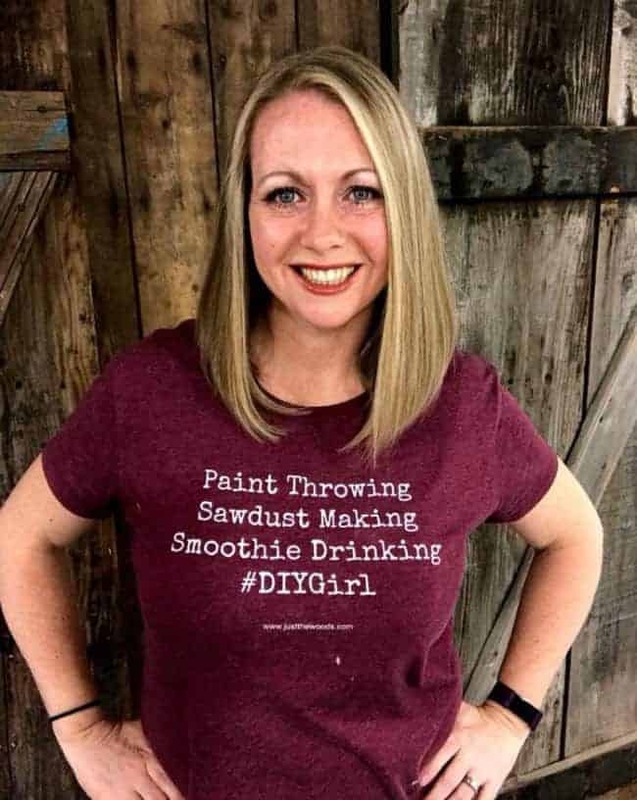 Here is the before… wait until you see the after! 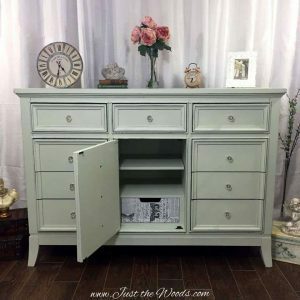 The drawers were all removed, including the drawer that’s hiding behind the center faux door and the entire dresser was thoroughly prepped. Many paint brands talk about no prep, but I always like to make sure to sand and clean each and every piece before I start. Here is a quick video that I did going over how I prep each piece. I know everyone has their own method.. this is mine.. 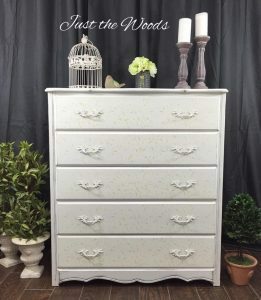 This extra large dresser was then hand painted in kiwi white, which is a soft vintage green and finished exactly the same as the night stands. 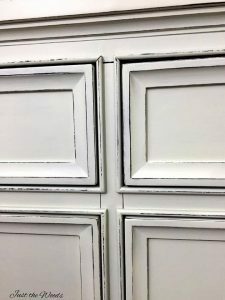 Rather than repeat my OCD method of how I finished the decoupaged drawers you can see the step by step process on the night stands post here. 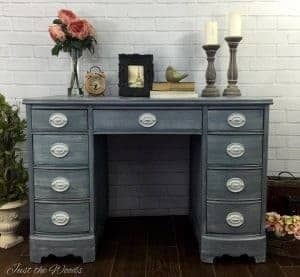 The only difference is that the nightstands had a total of four drawers where the dresser has ten. 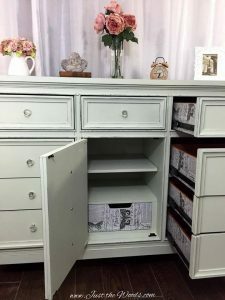 Nine of the drawers were done the same way with the print on the sides where the tenth drawer, the one behind the faux door was completed a little differently. 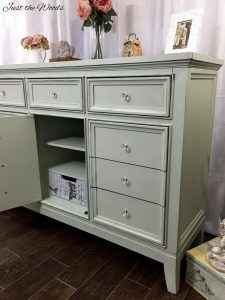 We decided to add the print on the drawer front making it visible as soon as the door is opened. The original hardware was removed, holes plugged and brand new clear crystal knobs from D. Lawless Hardware were added. 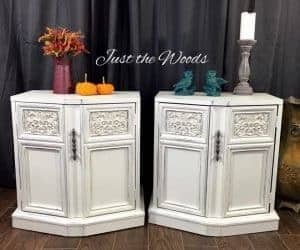 Aren’t they perfect for the piece? They add a much softer look as opposed to the original dark pulls. 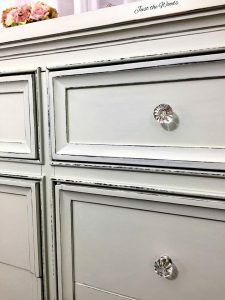 The dresser was distressed using my favorite flexible sandpaper revealing bits of dark underneath creating a vintage appearance. 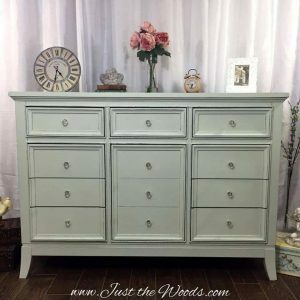 The transformation of this dresser is pretty drastic from its original dark finish to a new soft shabby chic, if I do say so myself. 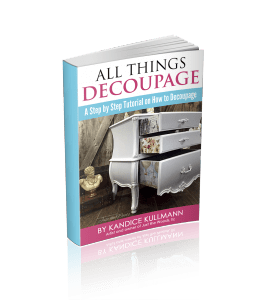 Interested in learning Decoupage? 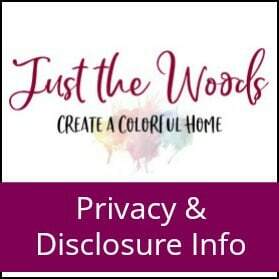 Check out my eBook! Love. Every. Single. Thing. Sensational! Nice! I love the look. Clean and neat from the outside, fun on the inside. In one word – Extraordinary ? thank you so much Denise! I hope you have a great weekend! 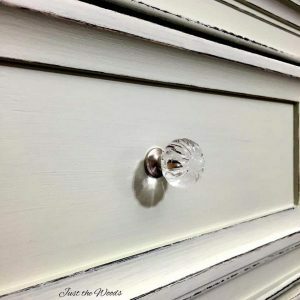 Loving the color and those knobs!